Clarence Davis has lived through a firefighter’s worst nightmare: he answered a fire call for his home. “I was on a 36-hour shift and 16 hours into it we got a call. The address was for next door but halfway there they said it was my address,” said Clarence. “I lost everything but the bed. The only clothes I had were the two uniforms I had with me for the shift. Within a few hours, everything in his home except his bed was destroyed. Family photos, antique fire station memorabilia, heirlooms passed down through generations. Clarence describes it like an oven, where his home’s thick concrete walls baked all of the contents until they crumbled. For the next six months, Clarence lived in the first fire station in Prestonsburg, Kentucky. In ordinary circumstances six months might not seem like a long time, but to Clarence, it felt like an eternity. While grateful for having a place to stay and for the friends who supported him through this tough time, he knew he would never truly relax until he built another home of his own. He started his search for a new home, visiting manufactured home retail centers in and around Prestonsburg. He compared prices, floorplans and financing options, and finally decided to buy a home from Hylton Sales and Rentals. Part of Hylton’s appeal was that they were a SmartMH retailer offering a free ENERGY STAR upgrade and access to new financing products. Clarence chose a 1 percent mortgage through Kentucky Housing Corporation’s partnering lender and SmartMH lender, Key Mortgage Company. This special financing product is available in the 54-county SOAR region to make buying a home more affordable. 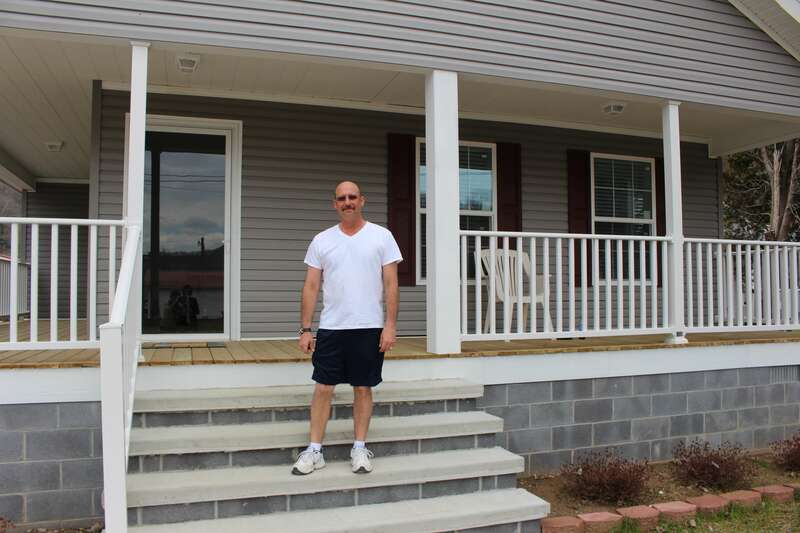 After Platinum Homes had built the home and it was ready to be installed, Clarence was on site to oversee the process. The new home would be placed exactly where his previous home once stood. His neighbors and people driving by on the highway came to watch, curious to know more about his new home. “The whole time it was going in, I had people stopping and talking about it, wanting to know where I got it,” said Clarence. On move-in day, Clarence felt a burden lift off his shoulders. It was one week before Christmas and even though all he had was a Christmas tree and a bed, he finally felt at home. He celebrated the holiday with his mother, a retired nurse, and grandmother, a former lieutenant in the Marine Corps and retired school teacher. He hopes to start hosting family and friends more often once he gets fully settled. From the curb, the exterior of Clarence’s home is warm and inviting. Grey with maroon shutters, white trim on the wrap-around porch, tons of windows. Bricks salvaged from his old home line the driveway and landscaping in the front yard. Inside, the rooms are spacious and filled with light. Clarence is also pleased with the difference in utility costs in his new ENERGY STAR® manufactured home. Even though it is twice the size of his old home, his bill is now half of what it used to be. Where he used to go on budget with his utilities, which could reach $600 a month in the winter, he can now expect low and manageable costs month to month. On top of those low utility costs, Clarence will reap even more savings from his low-interest mortgage over its 30-year term. Experiencing these benefits firsthand has made him an advocate for the program, recommending it to his friends and co-workers. So what’s next for a firefighter who has lost everything? Clarence plans to keep on doing his job with a new outlook on what people are going through. He also wants to put some more family pictures up on his walls. But long term, he wants to remember what is truly important.